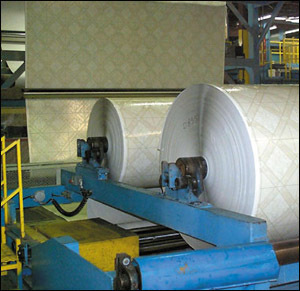 Americarpet: How is Vinyl/Cork made? Vinyl seems to be everywhere in our lives, part or all of a million different products for thousands of uses. Life without vinyl would be inconvenient at the least. Given that, you would think the construction of vinyl flooring would consist of a simple, age-old process, repeated as needed. Well, think again, shopper. The manufacturing of vinyl flooring uses highly sophisticated techniques, complex methods and precise systems. All to provide you with quality vinyl flooring. So come along with us as we explain how vinyl flooring is made. Who knows. What you learn here and in the other vinyl sections just may be what you’ve been shopping for: a flooring solution for the way you live. Rotogravure Construction: spinning endless possibilities. It offers you unlimited possibilities in pattern and design. Imagination, start your engine! Like the inlaid vinyl floor, the appearance retention of a rotogravure vinyl floor is dependent on the durability of the clear wearlayer. The wearlayer: not just important, crucial. The wearlayer is absolutely critical to the performance of your vinyl floor – it’s lasting potential. Resists staining from normal household products. Easy to clean up spills. However there’s good news, shopper. The new generation of vinyl floors has all the ingredients to resist showing wear and staining. Plus all the beauty, style and value to certainly put vinyl in the running as a potential flooring solution for the way you live.